I just paid $12.95 to mail trash to my nephews. And I lied to them. They’re 3 and 5-years-old. Someday I’ll ‘fess up. Guess what? I went to Yankee Stadium to watch a baseball game. It was a lot of fun. Since the Yankees are your FAVORITE baseball team I decided to bring you something from the stadium. They sell popcorn there too, but you can get popcorn at the Dollar Store, just like we did when we went to feed the ducks. Then I thought, “I know! I will get them Yankee Stadium Ice Cream!” And then I remembered, it’s very, very hot and if I try to put ice cream in an envelope and mail it to you it would be all melted by the time it arrived. For some reason I feel compelled to take time and write actual letters when I send things in the mail. So I crafted this story, dropped it to the printer and walked to the post office. Then I knew! I’d buy you both a cup of Yankee Stadium LEMONDAE. The game was long and it was kind of hot. So I had a little drink of your lemonade, Declan. And then, I was still hot, and the game was still going so I had some of yours too, Gunnar. Then I had a little bit more and it was time to go home. Then I started walking towards the post office to send it to you and I drank some more. And, before I knew it, I drank all of your lemonade (AND I had to go to the bathroom VERY badly!) Woops! Two cups is too much! So. 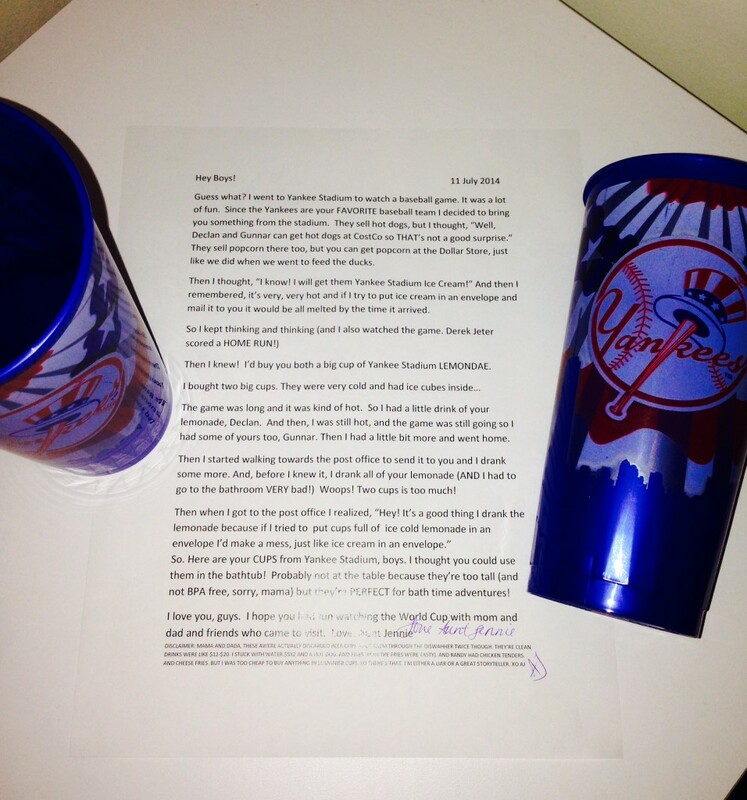 Here are your CUPS from Yankee Stadium, boys. I thought you could use them in the bathtub! Probably not at the table because they’re too tall (and not BPA free, sorry, Mama) but they’re PERFECT for bath-time adventures! I love you, guys. I hope you had fun watching the World Cup with mom and dad and friends who came to visit. My vote is great storyteller/adventure writer. I’ll buy your book when you are published!